Our custom ornamental wrought iron division has been designing and creating custom wrought iron furniture for over 15 years. Our one-of-a-kind hand-forged wrought iron furnishings and other unique designs are of the highest quality craftsmanship in San Francisco. Whether you're interested in one of our current designs, finding something that will fit your taste, or in finding a source for that unique iron piece you have always wanted, you've come to the right place. 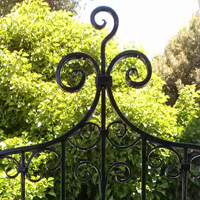 In addition to what you see on our site, we offer ornamental iron design services and we're always ready to take on any project you might have in mind. Please feel free to look around our website and let us know if you have any questions about our pictures and if there is something you want that you do not see, we will be happy to sit down with you and set up a free consultation.